September 30 - took a trip out to the hive today, as it's been two months since my last inspection. When we got there, the bees were coming and going from the hive in huge numbers. They know fall is here, and winter's going to come roaring around the corner, and there isn't too much time left for foraging. They're all working overtime to provision themselves for the long, cold months they'll spend cooped up inside with nothing to do. Winter must be a nerve-wracking time for them. Back in July, There had been some comb built on the central frames in the upper super, but very little - it was more of a light coating of wax than proper comb. I had hoped that by now, the lower super would be full of honey and the bees would have started turning their attention to the uppers, where there were eight empty frames waiting to be filled as well, allowing them to double their storage capacity. And once I got the center upper frame out (burr comb attaching it to the frame below made it difficult again), I was relieved to find that their progress was actually better than I had expected. There was lots of nectar, pollen and capped brood. The queen is present and laying eggs in the upper chamber, and the workers are preparing it for more. These girls make me proud. This is what I had hoped for. This means that the lower super is full -- or at least full enough that the bees have begun to focus their efforts on the upper frames -- and that the lower super is now considered by the bees to be almost exclusively "storage." The next time I inspect the hive (in about a month), this frame will more than likely be completely full, and the others around it may look like this one does now. In case you are wondering why I usually emphasize the center frames in my inspection reports, it's because honeybees work upward from below and outward from the center. In a brand new, empty hive, such as this one was back in May, the bees have the entire space to work on. Being such an organized society, they maximize efficiency by concentrating on the bottom of the center frame, building comb upwards, simultaneously on both sides, to cover the frame. When both sides of the center frame have been filled, they start at the bottoms of the frames on either side of the center, and so on outward toward the walls of the wooden super. Once the downstairs is full of honey, they move upstairs and begin all over again with the bottom of the center frame. When I installed this colony into the empty hive, there was only one super (which is now the lower super), but even if there had been two supers, a lower and an upper, the bees still would have begun working from the bottom of the lower frames first. Therefore, I use the center frames as a yardstick to measure their progress. Once I saw that there was nectar, pollen and brood in the center upper frame, I knew that everything is going well and the surrounding frames will receive their attention soon, and that the lower frames are, for all intents and purposes, full of ripening honey. If there had not been progress on the upper frames by now, it would have been an indication that something was seriously wrong, and I would have placed their chances of surviving the winter at somewhere around 20-25% without supplemental feeding with syrup. 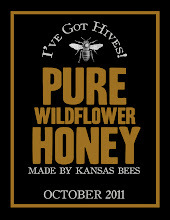 There simply would not have been enough honey to feed the colony, and they would starve once the stores were depleted. Now that they have begun filling the cells in the upper super, though, their chances of survival are increasing, and that's an encouraging thought. One of the rules in beekeeping is to allow your bees about 60 lbs. of honey to get them through the winter, and anything over that is yours to steal. A single frame, when full, holds about 6 pounds of honey. Because I'm using 8-frame equipment (8 frames in the lower and 8 frames in the upper super), the lower super alone, when full, can hold about 48 pounds of honey -- and that's assuming that all 8 frames are completely full. Now that my bees have begun filling the upper frames, they just might hit that 60-pound mark before the freeze. They still have a lot of work to do. Among all the frenzied activity in a hive, there are some bees that just don't really do much at all. While the workers are busy cleaning house, foraging for nectar and pollen, guarding the hive, raising young, controlling temperature, collecting water, building comb and attending to the queen, the drones, the males in the colony, live in luxury, without a care in the world. They benefit from their sisters' tireless industry and contribute nothing to the colony on which their survival depends. They eat all they want, sleep when and where they want, and bully the smaller workers. Since a stinger is a modified ovipositor, honeybee drones are stingless, so they can defend neither themselves nor the honey they jealously love and which they did nothing to produce. It's a wonder that their presence is tolerated (though perhaps grudgingly) in such a goal-oriented society at all. Drones are expected to do only one job in their lives: to mate with a virgin queen. When not availing themselves of the colony's stored food, they spend their lives lazily hanging out with the boys away from the hive in places called drone congregation areas. There they spend hours each day playing poker and shooting pool, and talking about how their women are always nagging them to take out the garbage (or the bee equivalent) as they wait for a queen to fly by. Yes, they've got it tough, those drones. 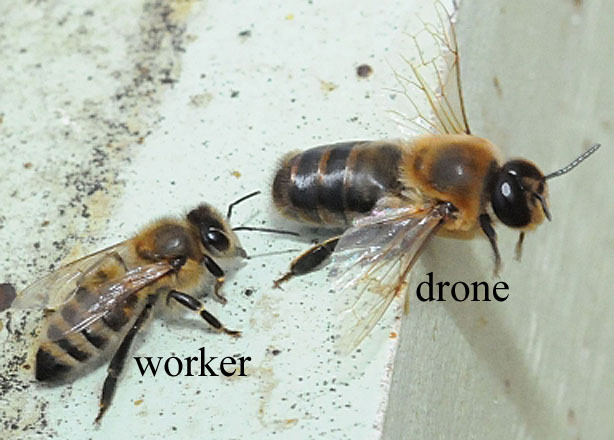 It's still unknown how drone congregation areas are designated, but they are agreed-upon locations that are known by both the drones and the queens from all the hives in the general vicinity. Because a queen's nuptial flight is fraught with danger, and she risks her life by leaving the safety of the hive to mate (usually only once in her life), it makes sense that there should be a specific place for her to go in order to mate quickly and return to the hive. Congregation areas are also convenient for providing a genetic variety and preventing inbreeding. These areas are usually found in the same place year after year, which raises some interesting questions. How do the drones, who have never been to the congregation area before, know where it is? For that matter, how do the queens know where to find them? What are the criteria for an acceptable location for a congregation? Geographical features such as hills and valleys or water sources? And for that matter, what if the criteria are not met some year? Is there an alternative system for designating one? For now, these are among the secrets that the bees see fit to keep from us. 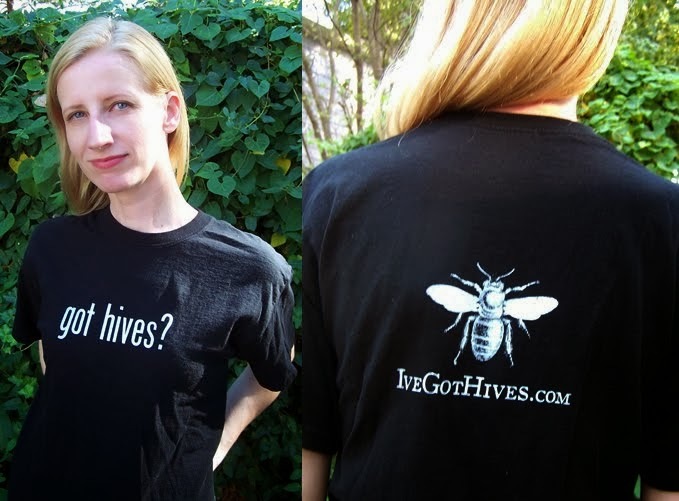 When the weather is good and a virgin queen takes off from her hive on her nuptial flight, she will fly to a local drone congregation area, exuding pheromones and flashing her best come-hither looks. The drones will fly after her and chase her down, mating with her while in flight. The mating itself takes place at relatively high altitude, out of sight of observers on the ground, and so is rarely witnessed by beekeepers. Unlike many other species, there is no competition between drones for the opportunity to mate with the queen - no battles to the death or chasing each other off, with the victor earning the right to mate. There are two main reasons for this: firstly, since drones don't have stingers, they lack the necessary evolutionary weapons for such battles, and secondly, because the queen flies through the area and does not stop, any drones who engaged in such contests would simply find the queen gone after taking the time to vanquish their rivals. So the drones who can fly fast enough to catch up to the queen get to mate with her, thus achieving their purpose in life. But here's where cruel irony steps in: the act of mating itself is fatal to the drones. Upon the release of sperm, the drone's reproductive organ (the endophallus) tears off, along with part of his abdomen, and remains attached to the queen, forming a plug that prevents the loss of sperm after copulation. (This is known as eversion, and it's said that there is actually an audible pop when the endophallus breaks off.) The mortally-wounded drone then falls to the ground and dies soon after. This plug also provides visible evidence of her successful mating flight, to be removed by the workers, when she returns to the hive. Maybe it's because of this agonizing sexual suicide that the workers in a colony tolerate the presence of the boorish drones who treat them so cavalierly. It's possible that the girls feel some measure of pity for them. If that is the case, though, that pity and tolerance doesn't last. When the weather becomes colder and the colony prepares for winter, the workers turn on their brothers and physically eject them from the hive. Since mating season is over and the drones have big appetites, they are forced out in order to conserve the winter stores. Some drones will attempt to re-enter the hive and are killed. Others are resigned to their fate and remain close to the entrance, where they succumb to the cold or to starvation. It's tragic, in a way: these are the drones that were not fast enough fliers to earn the right to mate with a queen and die, and it almost seems to be a punishment for their physical shortcomings and inability to pass on their genes. If their life's purpose is not served during the warm season, then their contract with the colony, their own family, is voided and they are replaced in the spring. Here's one last bit of information about drones that I find worth mentioning. Because the female workers are produced from fertilized (diploid) eggs and the male drones from unfertilized (haploid) eggs, honeybee drones do not have fathers. Their nearest male relative is a grandfather on their mother's side. Interesting stuff, no? See you again soon. Maybe you should give your brother a call. Or better yet, why not send him a t-shirt?